Lecture by David M. Lank CM, F.R.S.A., F.R.C.G.S. In its first event of the year, the Friends of the McGill Library presented David Lank, Director Emeritus of the Dobson Centre for Entrepreneurial Studies at McGill, who gave an illustrated lecture to introduce “Every Stamp a Story,” the exhibition of 200 stamps and related postal history material which forms part of the 50,000 natural history stamps in the Lank Collection. Principal Suzanne Fortier acknowledged the presence of the Chairman of the Board, and other McGill and civic dignitaries before introducing the curator to the overflow audience. 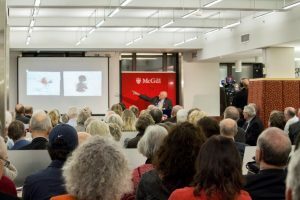 This collection, the world’s largest featuring birds, mammals and other wildlife, is housed in McGill’s Rare Books and Special Collections in the McLennan Library Building. The exhibit will remain on display there and on the mezzanine of the Library until May 14, 2017. David’s main focus this evening was the stunning beauty of the artwork on natural history stamps and the unexpected stories behind each. He showed his enthusiastic audience gazelles from South-West Africa, woolly mammoths from Moldova, Canada’s own beaver (our 1851, stamp being the first in the British empire not to show Queen Victoria), a gorgeous impressionistic wandering albatross from the Terres Australes et Antarctiques Françaises, dragonflies from Japan, buffalo in the snow from Canada, bald eagles from Curaçao, a peregrine falcon (twinned appropriately with a stamp showing a jet) from Gibraltar, a pelican from Albania, a frigate bird from the Gilbert and Ellice Islands, chamoix from Liechtenstein, and many more. Some of his stamps showed not just the animal but also its habitat (buffalo in the snow, moose in wetlands, trumpeter swans along a northern river, etc.). David introduced Lyse Rousseau, the doyenne of Canadian stamp dealers and the sponsor of the evening, and wildlife artist Claudio d’Angelo, who has painted the birds shown on many stamps issued by the Fondation de la faune du Québec, to the audience. David also gave us a glimpse of the history of postal systems, with actual 4,000-year old clay tablets from ancient Babylon, from biblical times (see the book of Esther), to delivery by horse-drawn chariots in the Roman era, through privately run trans-border post by stagecoach in Europe (such as the service by the Taxis family as early as the 14th century), to the Pony Express in the western US, to pigeon post in New Zealand before Kitty Hawk, to delivery by zeppelin. In the early 19th century, when many postmen were illiterate, urgent letters were indicated by feathers affixed with sealing wax! The first adhesive stamp, paid by the sender (a radical improvisation at the time), was the imperforate British Penny Black of 1840, which is on display. 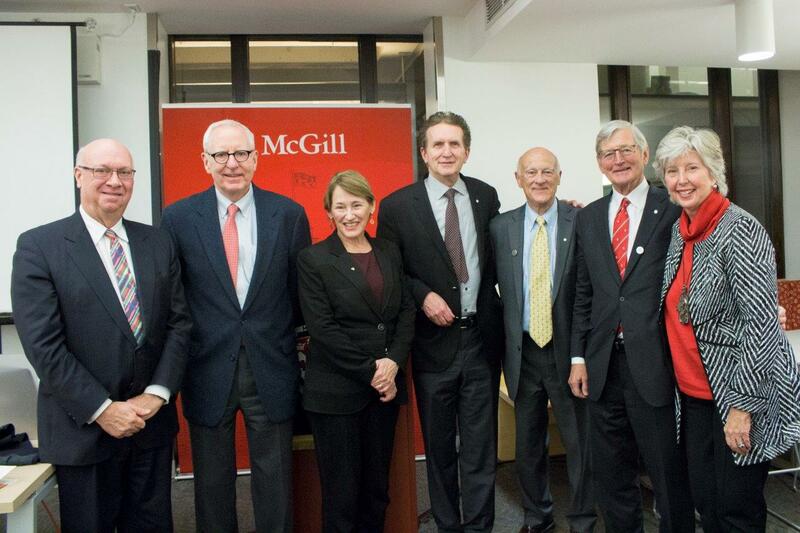 Michael Meighen, the Chancellor of McGill, thanked David, and introduced Robert Waite, Chair of the Stamp Advisory Committee of Canada Post. He explained the process for deciding on the design of postage stamps, and remains optimistic about the future of the traditional postal system. Mr. Waite officially declared the Exhibition to be open. Missed the lecture? View a recording of it online here.